There are few things as antithetical to great drama as an unmitigated hero, a character rendered almost inhuman by unfailing nobleness and valor. In fiction and non-fiction alike, we are inevitably more compelled by the flawed and conflicted of our kind – whether in lurid warts-and-all celebrity biographies or more subtly probing character studies. In film, true-life heroes often make for worthily sanitized Oscar bait (from “Gandhi” to “Milk”), but they rarely provoke great art. Few figures bear out this truth as handily as Nelson Mandela – a man who is surely the greatest political hero of our time, but who has nonetheless inspired a number of crashingly dull books and films. It’s not that the man wants for character or complexity: Mandela’s deserved (if artfully self-engineered) modern sainthood belies his early days as a fierce firebrand, but few biographies (and to date, no biopic) have bridged that gap, or made much of an attempt to study the man beneath the myth. So it comes as no surprise that John Carlin’s “Playing the Enemy,” which forms the inspiration for Clint Eastwood’s recently-titled film “Invictus,” does little to change this, casting the first black president of South Africa less as a freestanding character than as a perma-haloed symbol of democratic benevolence. Of course, in this instance, Carlin’s intent was not to write another Mandela biography – just as it should be stressed that Eastwood’s film isn’t really a Mandela biopic. 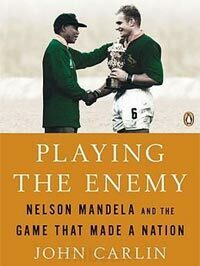 In narrowing his focus to South Africa’s monumental victory in the 1995 Rugby World Cup, the currency of which extended beyond simple sporting patriotism to a kind of symbolic consolidation of the country’s international post-apartheid rehabilitation, Carlin’s aim is precisely to dehumanise Mandela to an extent. At the book’s core is the somewhat tenuous thesis that Mandela almost single-handedly enabled this against-the-odds triumph via an elaborately strategized charm offensive – though Carlin pays sporadic attention to Mandela the man, his chief interest lies in the mid-1990s invention of Mandela the brand, and the influence it could wield. In the brevity and inelegant functionality of its prose, the book actually reads a lot like a film treatment, so it’s no surprise that Hollywood should have taken to it. Carlin doesn’t temper the inspirational elements of either the political or the sporting narrative involved: taken as read, “Playing the Enemy” provides the foundation for an unusual, if unashamedly mainstream, fusion of old-fashioned sports-drama sentiment and equally misty-eyed message-movie politics. There’s a reason why “Invictus” is sitting atop many people’s Oscar prediction lists. The bulk of Carlin’s book, rather, fills in the political context around the event. Beginning with Mandela’s last few years in prison, where (as Carlin would have you believe) the idea for unifying the country through rugby first came to him, it goes on to offer a potted history of the final years of white rule, a fascinatingly fraught period that encompasses such momentous events as the bloody last stand of right-wing nationalism and the assassination of Chris Hani – none of which appear to be in the film. This is a sensible choice, given that Carlin himself seems unconvinced of how most of these events link to his central World Cup narrative, but it’s unfortunate that this far more dramatically substantial material is still awaiting a film of its own. As a South African myself (and, for the sake of full disclosure, the son of a Mandela biographer), one who was as captivated by the events of June 1995 as Carlin evidently was, it’s possible that my expectations for both book and film have been pitched too high. Academically, Carlin’s book is both too big and too small in scope, overegging the significance of a single sports match while oversimplifying the surrounding circumstances. Still, as pop history goes, it seems to have pleased quite a few people – and the film looks likely to do the same. At the very least, even if the film deifies Mandela in as two-dimensional a fashion as Carlin does, it should provide Morgan Freeman with a solid, charisma-driven bid at Oscar glory. Of greater concern is the book’s decidedly shallow, and borderline condescending, characterization of Pienaar, incidentally a law graduate and currently a successful businessman, as a kind of simple, gentle-giant type – I was especially irked when Carlin describes him as a man “for whom big words like ‘nation-building’ carried little meaning.” With such bland raw material, I can only hope Matt Damon manages to convey a little more going on inside the man. But perhaps the book’s greatest failing – and a flaw to which the film is highly susceptible – is just how blinkered and out-of-time it reads when set against the current political landscape of South Africa. 14 years on, the Springboks may once more be the World Cup holders, but much of Mandela’s heroic social knitwork has unravelled as the party he brought to power, and even some individuals in Carlin’s story, have lapsed into corruption. Carlin makes no mention of this whatsoever, choosing not to spoil his happy ending. I’m sure Hollywood won’t mind. My thoughts exactly, Guy. The draft I read had Pienaar way to the periphery of the story, like, not really a supporting character. I wonder if Damon’s role has since been beefed up. We’ll see. There are stories out there about Mandela, South Africa, Apartheid, and even Pienaar, but Invictus isn’t one of them. Just a gloss and an overview. To be honest, I’ve always thought Winnie Mandela’s story could make for the more interesting film. And evidently, someone at the BBC agrees with me. Juicy opportunity for Sophie Okonedo there. Pompous, overblown nonsense. It’s a film about a moment in time. And the hopes that went with it.That’s all. Not a try was scored! Save me from this arrant twaddle. While I greatly appreciate the insightful points in this review, I think it misses an important point. The fact that the movie was interesting enough to prompt a middle-aged American (me) to investigate Nelson Mandela and the changes that occurred in South Africa after apartheid. Its true this doesn’t require historical accuracy or literary excellence, but stimulating curiosity about South Africa seems like a valuable outcome to me. I am a white South African woman and I really do hope that this story, written and shown on celuloid, will help black/ white relationships in South Africa to improve. We need every little bit of encouragement. It is a true story. Maybe the actual game was embroidered a bit. But South Africa, against all odds got to the finals, and then won. Nelson Mandela used every bit of his great wisdom to help them win. Prayer, meditation, contemplation, silence, etc., call it what you will, exposes one to the great wisdom of the universe. Nelson Mandela used his time of incarceration to tap into that power. He is a wise and beautiful human being , because he has truly learned that we are all one. He helped South Africa then. Lets hope this book and film will help SA now. I would like this book to be a set work for schools in SA and for the film to be shown to every child in every school throughout SA.